Deborah Henson-Conant (“DHC”) is a GRAMMY©-Nominated one-woman orchestra. With electric harp, voice and a looper pedal that she layers sounds in real time, then weaves solo lines and vocals above it. Her signature instrument is an 11lb carbon-fiber electric harp, designed specifically for her by the CAMAC Harp Company in France, it’s now one of the fastest-selling new harp models in the world and was named after her. In her 2018 TEDx talk she tells the story of how conceived of the instrument and what it took to bring it to reality. Forget the demure harpist – forget the Classical Music — forget dozing off in the back row. Henson-Conant is a showman, entertainer and solid musician who’s been compared to musical greats from Leonard Bernstein to Elvis Presley. Because I combine story, music and physical expression I’m constantly shifting media between solo performances, ensemble, orchestral and theatrical. Each gives me a different lense to explore and express musical ideas. There are years when I focus only on creating one-woman shows, others when my focus is on original orchestral or chamber music or on collaborations with dance – and other times, like in the period from 2013 – 2017, when my main focus was on creating an online school where I can pass the baton of what I’ve learned about creative expression, musical form and improvisation to musicians who need that piece of the puzzle. My goal, as a performer, is to combine spontaneity with story, to bring the message alive with music and to lift the audience from the burden of consciousness for a moment and to drop them lightly back, slightly changed. I’m constantly shifting between my fascination with the invention of individual expression and the alchemy of collaboration and co-creation. I’m constantly exploring the opportunities that online performance give to reach audiences, along with the power of connection – for both audience and performer – that live on stage gives. The embodiment of music – in stories and physical expression – is what moves me as a composer, whether that’s in solo works for harp, musicals, dramatic song-cycles, chamber music, concertos or jazz suites. The incredible sense of LIFE that explodes when story, character and physical expression become music – when the composition releases the performers and the performers release the music. Some of my most meaningful achievements as a composer are big, lifetime achievements – like my Grammy Nomination for an album of original symphonic works for harp, voice and orchestra – others are my everyday delight at seeing the versions of my compositions that other artists post on line, realizing that my personal artistic expression is now fueling their personal artistic expression. I’ve passed the creative baton. What was once my unique creative idea is now a facet of their unique artistic voice. 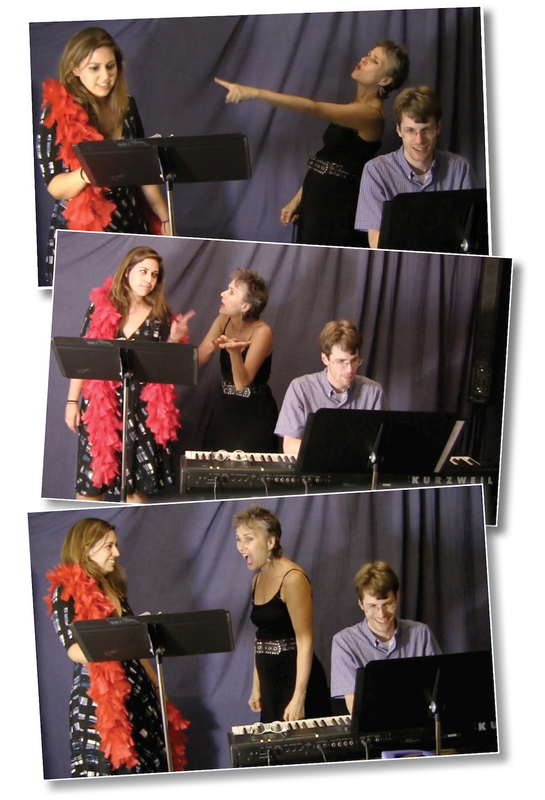 As I publish more and more of the work that I originally created for my own performances, I’m enjoying the thrill of coaching other performers on my own works (below, with soprano Jeila Irdmusa and pianist Tim Maurice) and conducting performances of my concertos with spectacular soloists (above, with the Louisiana Philharmonic Orchestra and soloist Eleanor Turner). “Hip Harp Academy” is a year-long curriculum to teach harpists the basics of arrangement and improvisation. The online school combines pre-recorded video lessons, PDF downloads, a closed Facebook Community, optional weekly assignments with feedback examples, and a weekly live online Q&A. The Academy is for levels from fledgeling (Adv. Beginners) to professionals. Each program begins with basic concepts and then expands, so students maintain membership in the Academy for several years, repeating classes and expanding their skills each time. Learn more about Hip Harp Academy here. In “Harness Your Muse” I work with a small group of dedicated artists commited to achieving a major artistic or career goal (like a performance, publication or album release) — or a major exploration of a new artistic or career path (like composition). This program includes a vast vault of resources I developed for my own creative and career projects plus bi-weekly small group coaching and mastermind sessions. Learn more about Harness Your Muse here. In these half-day (4 hour) 1-on-1 coaching sessions I work with clients to create the foundation for a career-change, develop a show, map out a PR campaign or outline the steps for a creative project. People often use these sessions to jumpstart a project, or get an overview of what their next steps are if they’re not already a member of my Harness Your Muse mentorship program. (“Harness Your Muse” includes regular virtual retreats that are similar to these VIP Sessions, though in a small group environment.) If you’re interested in a VIP Coaching Session use the “Ask a Question” form to ask for more information. 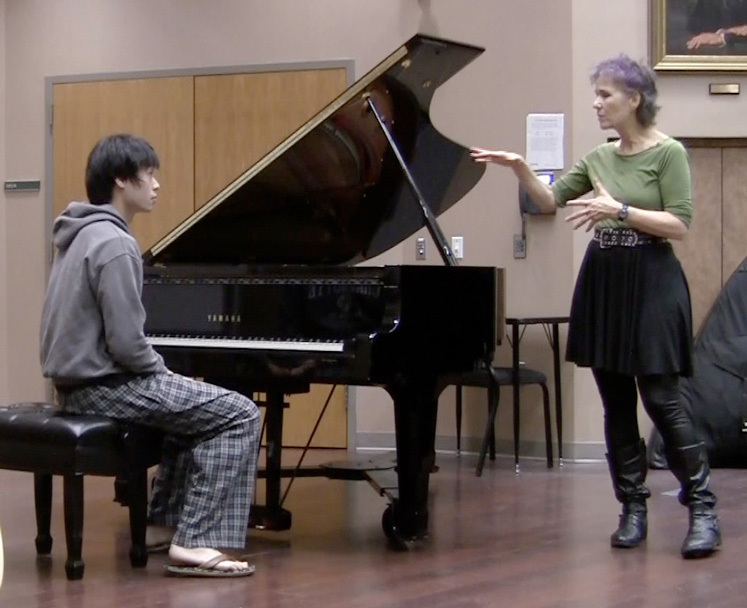 In University Residencies I combine coaching in creative entrepreneurship with collaborative performance, improv and performance coaching in my residencies. In workshops I share real-world musical issues from entrepreneurship, to career choice, to how to bring your authentic voice to your performance and give students an opportunity to ask questions from an artist who has successfully maintained an independent career in music that includes performing, composing and the development of a successful online teaching academy. Harp Clinics & Workshops – When I travel, I’m often hosted by festivals or harp associations for workshops in improv and performance skills including Impromptu Arrangement, Blues, the art of telling your story with music, combining spoken word with music, harmony and theory, how to read lead sheet, etc. For more information on potential workshops use the “Ask a Question” form to connect with my team and ask for the catalog of workshop descriptions. Live Performance Coaching – These 90-minute sessions usually focus on one performance issue or on how to perform any of my original pieces. Some students have used these sessions to go over the fundamentals of improvisation if they need to apply it quickly and to a specific performance opportunity, and don’t have time to go through the classes in Hip Harp Academy. Other uses of the live performance coaching sessions are preparation for a performance or recording. Use the “Ask a Question” form to request more information about live performance coaching at my studio. Masterclasses & Megalessons – While I can present standard masterclasses where one performer is getting coached while other observe, I generally prefer what I call “Megalessons” where a group of 3-4 performers – all of whom have instruments – shares a 90-minute session and where each person brings a specific issue to work on, and as we work on that, I show each of the others how to apply similar principles at their own technical level. I usually schedule Megalessons at teaching festivals. Use the “Ask a Question” form to request more information about megalessons and when/where the next set will be scheduled. ‘Performance for Musicians’ Week-Long Workshops – These are usually 5-6 day workshops which I present in collaboration with my teaching partner, mime-dancer Karen Montanaro. In these workshops, performers are led through a series of exercises, games and coaching sessions which Karen and I developed from work with our own mentor, Tony Montanaro. The goal of these sessions is to develop a strong understanding of physical expression and bring that to the instrument. To sponsor a ‘Performance for Musicians’ workshop use the “Ask a Question” form to connect with someone on my team. What you see above shows three points in time along the genesis of the “DHC Harp” – the result of my decades-long collaboration with the CAMAC harp company to create this new instrument. In the first picture I’m holding the first wooden prototype I created – even before I had developed the harness that allows me to wear this harp and move unencombered. In the middle image, at the factory with Jakez Francois, the head of CAMAC harps, looking at the newest design of the harp’s carbon-fibre body. On the right, on tour with rock guitar legend Steve Vai, playing the “DHC” harp, with a lighting system created by Vai’s long-time guitar tech Thomas Nordegg. The development of this instrument has allowed me to compose and perform symphonic music and one-woman shows that would never have been playable with a conventional harp. The “DHC” harp has the volume capacity of an electric guitar – so it can hold its own with full symphony orchestra – or rock band – yet as an electric harp it has an emotional range from extreme tenderness to bombast – in styles from Latin and Flamenco to Blues. The portability of this harp (it can fly as luggage in its case) has allowed me to travel the world, and instead of having to borrow or rent instruments wherever I land – with all the insecurity and technical problems that creates – to be able to bring my own custom-designed harp with me. To people who’ve seen guitarists or violinists travel with their instruments slung over their shoulders, that may not appear to be the revolution that it has been in my own life. To be able to get on a plane with 2 bags – one of which is my harp – makes it realistic to have a life as a touring musician. Because this instrument has a full harmonic and emotional spectrum, and because I use it with a looper to layer sounds into lush soundscapes, it provides a complete accompaniment for my One-Woman musicals. That means that this one instrument which I wear – can be the entire musical score – from almost subliminal incidental music to lush production numbers — all performed live and all with one instrument, one voice and a looper pedal. That gives me an incredible opportunity for spontaneity and response to my audiences. It gives me physical freedom. The instrument itself affects my performances – and my ability to connect and be responsive to audiences. But one of the greatest thrills, after years of commitment and collaboration to create the instrument of my dreams — that this instrument has now become the springboard to so many other performer’s dreams and so much innovative playing. I now see many of the most innovative young harpists playing this harp, which I’m so proud to say carries my name – and expressing their dreams in their own innovative performances. It’s profoundly moving to realize how this collaboration with CAMAC to fulfill my own personal artist dream – has now opened the way for so many other artist’s dreams. Who knew, when I first said: “But, why can’t I wear the harp? ?” that it would lead to a collaboration that would change harp playing forever. I’m both deeply proud and profoundly grateful to have been part of that.